Thanks to a partnership with Songkick, Spotify listeners will now know whenever their favorite bands are coming to town. 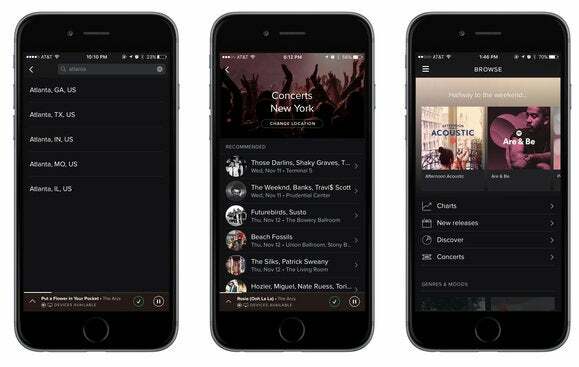 A new update promises Spotify listeners will never miss their favorite bands whenever they’re in town. On Thursday, the music streaming service announced a partnership with tour tracking site Songkick to intergrate personalized concert recommendations into the Spotify iOS and Android apps. Found in the Browse tab, the new “Concerts” feature will provide Spotify listeners with a personalized list of upcoming tour dates based on their location and listening habits. As with Spotify’s Discover Weekly personalized playlist feature, Concerts will include live shows by artists you love, as well as some new artists that the Spotify algorithm thinks you might like. “...as your music taste evolves, so will your recommendations,” Spotify wrote on its company blog. This new feature also lets Spotify listeners who are traveling “Change Location” to see tour dates in another town. Once Spotify listeners discover a concert they’d like to see, they’ll be able to find and purchase tickets through Songkick’s list of ticket sellers like Ticketmaster or StubHub. It’s a very similar integration with Songkick that Rdio has had since March. Why this matters: As big tech giants stomp their way into music streaming (Apple Music launched this summer, and YouTube Red launched last month), indie streaming services like Spotify, Rdio, and Pandora are looking for new ways they can be vital to their users. In the last year, Spotify has launched a running mode, podcast and video integration, personalized playlists, and now concert recommendations. Internet radio service Pandora went one step further with concert recommendations by getting directly into ticket sales. Last month, Pandora acquired Ticketly, a Ticketmaster competitor, after noticing that one of the most popular audio ads on its platform were the ones promoting concert tickets. Live Nation, the tour company that operates Ticketmaster, reported a record-breaking summer with revenue of $2.67 billion. Music fans are going to live shows more than ever, so it makes sense for Spotify to be a part of that discovery engine, especially as deep-pocketed competitors have started tackling its core business.